Fairmount Elementary School 2nd graders experienced the joy of learning how physical education, nutrition, gardening and cooking are important components in creating and maintaining a healthy mind and body. All SFUSD students will become literate in 21st century physical education, life-long fitness and wellness. They will develop positive social skills, learn to self-assess, learn to set personal goals and become informed consumers. Our ultimate goal is for students to embrace heal﻿thy lifestyles and become joyful learners through physical activity. 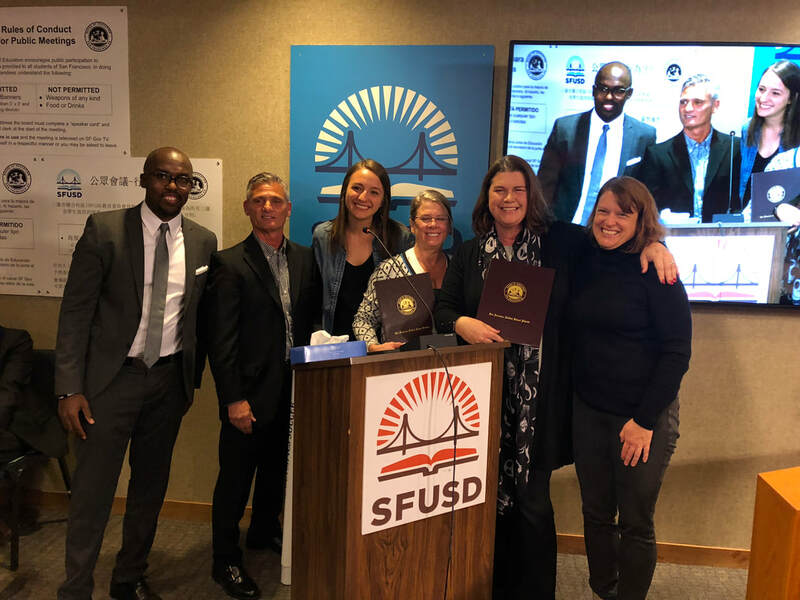 SFUSD an﻿d the Physical E﻿ducation Department envisions all students will embrace lifelong fitness and learning through movement. 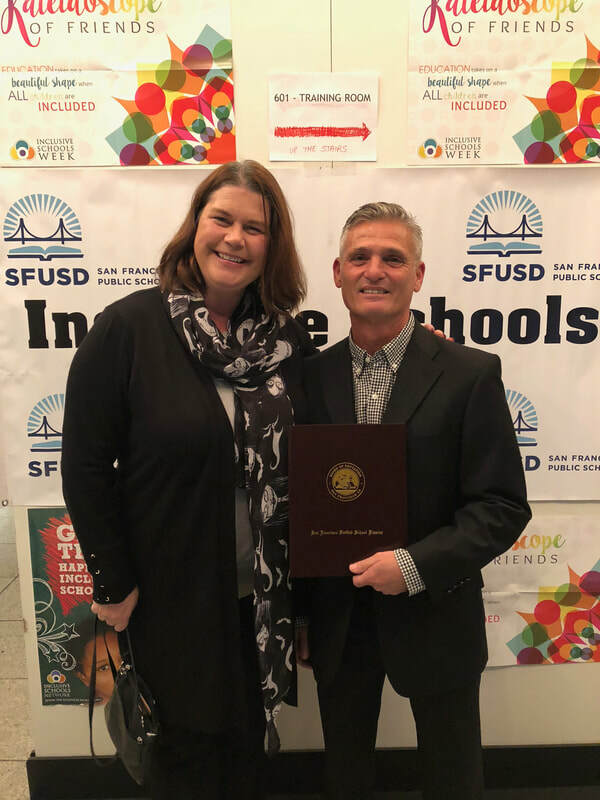 Michelle Zapata, Director of Physical Education and Activities and Mike Prutz, Physical Activities Inclusive Practices Teacher receive SFUSD School Board honor for outstanding work to promote inclusive and healthy opportunities for all students, with and without intellectual disabilities, to learn and play together. Coming Soon - Seeking Public Input regarding SFUSD Physical Education Programs - A survey to provide feedback towards the redesign of SFUSD Physical Education Master Plan will be posted in May 2019. All comments and suggestions are welcomed. Students from Everett MS PE classes will taken on the challenge to complete a 5K run along Ocean Beach. Individuals may take the pledge to participate–by biking, rolling or volunteering for Bike & Roll to School Week–and you’ll be entered in a drawing to win one of three Cleary bicycles in your child’s size ($310-$425 value). Alamo, Bessie Carmichael, Bryant, Cesar Chavez, Charles Drew, Commodore Sloat, ER Taylor, Geroge Moscone, Gordon J Lau, Hillcrest, John Yehall Chin, Lafayette, Robert L Stevenson, Spring Valley, West Portal Elementary School will come together on April 24, 2019 in Golden Gate Park’s Hellmen Hollow to complete a non-competitive run alongside family, friends, teachers and paraprofessionals. Students prepare for this event throughout the school year during physical education class. May 13th kicks off a 2-week event for approx. 2,300 5th-grade students. Students will participate in golf skills stations, enjoy lunch, and discuss life skills. Unsure of who to contact? Email: PESFUSD@sfusd.edu or contact us through the website by submitting a message through the Contact the PE Department section.